Your outdoor equipment is much more useful if you use proper organization. In organizing your equipment for all seasons of the year, you can become more effective in your yard. Learn how you can organize your outdoor equipment for any season so you know where your tools are at all times and can feel confident that you are storing them properly so they will last. 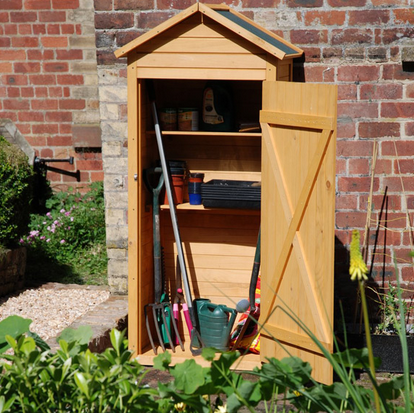 Organize your smaller tools by purpose in your shed so you can grab your gardening tools, mechanic tools, woodworking pieces, etc anytime you need them. Sliding shelves is an excellent option for smaller tools, like wrenches, boxes of nails and screws, and other items like oil and gloves that you may be reaching for more frequently. Keeping them in a shed allows them to keep from going missing and allows you to complete projects with ease. This type of organization also allows you to keep track of the equipment you have versus the equipment you need. Larger equipment, like your snow blower, commercial aerator and lawn mower, can be stored under and awning against the house for when you need them. Only take them out of a shed or garage when the season is right for them to avoid weather damage or theft. In keeping your equipment stored in the shed according to seasonal use, you won’t have to worry about multiple pieces of machinery clogging up your property and can have easy access to your equipment as the next season rolls around. Finally, your basic outdoor tools, like hoses, bricks, shovels, and rakes can be stored in your wheelbarrow and set inside the garage or shed until spring. These items can also easily be placed next to the house with a tarp to prevent water getting to them during the fall and winter months. This simple storage and organization allows you to have immediate access to these daily pieces of equipment for your outdoor use any time of year and make outdoor chores more convenient overall. Whether you just want to keep your equipment organized so you can see what tools you have or you want to make seasonal transitions easier, you can use these simple tips to keep your equipment and tools well-preserved and out of the way when you don’t need them. In organizing your many tools and equipment you can work around your yard more effectively and keep better care of your expensive equipment.